The stand-out result in the Clacton and District League this week was in Division One where a full-strength Brotherhood C demonstrated what a potent force they can be by inflicting an 8-2 defeat on Windsor Eagles. For the first time in the season-and-a-half of their current incarnation, Kevin Gowlett, Alan Burgess and Oli Reynolds all played together for the Brotherhood side - with an impressive outcome. Gowlett starred with an unbeaten maximum whilst there were two each for Burgess and Reynolds, Burgess needing a full five to beat Gary Cattermole 6-11, 11-8, 14-16, 13-11, 11-8 as did Reynolds against John Pattrick 11-5, 9-11, 9-11, 11-4, 11-7. The Eagles' points came from the final two matches of the evening, Phil Smith beating Burgess in four and Cattermole scraping past Reynolds 11-7, 6-11, 9-11, 11-8, 13-11. Nomads Lions and Walton A enjoyed a good scrap, the match ending with honours even, the Lions' first drawn match of the season. Paul Hume stayed undefeated for Nomads, his three including a notable 11-9, 7-11, 12-10, 9-11, 11-7 victory over Gary Young. Skipper Adam Wilkin defeated Graham Buxton in five for a fourth point whilst the Hume-Wilkin pairing combined to take a vital doubles 9-11, 13-15, 11-8, 11-8, 11-7 against Young and Gavin Price. Young and Price won two each for Walton, and Buxton one. Four of the matches went the distance in another tight match which saw Brotherhood B edge past Windsor Hawks 6-4, despite a battling hat-trick from Windsor's Andy Vincent who beat Martin Edwards 11-9 in the fifth to deny the Brotherhood player his own treble. Gracie Edwards took a couple for the winners whilst John Owen enjoyed a narrow 11-7, 2-11, 10-12, 13-11, 11-9 success over Elliott Attrill. Leaders Nomads Panthers defeated bottom-side Windsor Owls 10-0 to become the first team in the League to reach hundred points for the season. Joe Andrews, making a rare appearance for the Panthers, struggled before over-coming the dogged Frank Burbidge 7-11, 11-9, 13-11, 10-12, 11-3 whilst it was an equally tough 9-11, 11-7, 16-14, 13-15, 11-6 battle for John Hatley against Mark Salter. Gill Locke took a more comfortable three for the Panthers. It was also 10-0 for second-placed Windsor Condors against Windsor Kestrels, Greg Green, Felipe Rodriguez and Annabelle Rodriguez all taking trebles. In the only match which went the distance, Felipe Rodriguez beat Dave Martin 11-2, 9-11, 11-5, 14-16, 11-5. Brotherhood H stay top of Division Two following their 7-3 victory over Nomads Bobcats. Stewart Murray stayed undefeated whilst Grant Sharpe won a couple and Graham Parkes one. Jason Lloyd won two for the Bobcats and Ethan Lloyd one. The closest match was the doubles, Murray and Sharpe winning 10-12, 11-7, 11-8, 12-14, 11-7 against in the two Lloyds. It was also 7-3 for Brotherhood I against Nomads Tigers, with three from Kris Stefanov, two from Mark Ratcliffe and one from Mark Beckham for the winners. Phil Wolski took two for the Tigers, denying Ratcliffe his hat-trick by defeating him 7-11, 11-6, 12-10, 6-11, 11-9. John Marshall picked up the third Tigers' point. Brotherhood D were 9-1 victors over club-mates Brotherhood E for a second time this season, Lee Harvey and Russell Hillier unbeaten. Duncan Dunne was the 'E' team's best player, enjoying a good 12-10, 12-10, 11-9 victory over Paul Alden in match one and then, in the final match of the evening, taking Harvey all the way before going down 11-6 in the fifth. It was a tight tussle at St James Hall between Windsor Buzzards and Windsor Harriers, the Harriers emerging narrow 6-4 winners to reverse an early-season result. Pete Bloomfield of the Buzzards was the best player on the night, his treble including a 12-10, 11-4, 9-11, 9-11, 11-4 win over Jenny Higgins and a 12-10, 10-12, 11-4, 6-11, 11-7 victory against Isabel Barton. Barton won a couple for the Harriers and, with Higgins, won what proved to be a crucial 11-7, 11-5, 8-11, 11-9 doubles against Bloomfield and Ray Chillingworth. It was also 6-4 for Walton C against Windsor Magpies, Rivhu Khan winning three, John Long two and Lynette Sparks, opening her account for the season, one. For the Magpies, there was a couple for John Plummer and one for Dave Sweetland, the pair combining to beat Khan and Long 11-13, 8-11, 11-7, 11-8, 11-7 in the doubles. But it was an easier 10-0 for Brotherhood F against Nomads Pumas who were doubly-hampered, first by having to field a guest player and then by injury to Eric Lemke in his final match of the evening. In Division Three trebles from Mike Hillier and Doug Green were the back-bone of Nomads Wildcats' 8-2 success over Brotherhood G. Paul Metcalf and Rob Bright, making a welcome first appearance of the season, took a point each for the losers. It was also 8-2 for Nomads Caracals against Windsor Swallows, a repeat of their early-season encounter. Chris Jones and Vic Little stayed undefeated, although Little had to fight hard to beat Iris Howlett 11-4 in the fifth and Paul Dale 11-8 in the fifth. The two Swallows' points came from Howlett, an 11-6, 6-11, 11-7, 10-12, 11-8 winner against Hazel Blanche, and Dale. Windsor Kites drew for a sixth time this season, and a second time against Windsor Ospreys - although, unusually for a drawn match, all the matches were settled in three-straight. Jordan Webb of the Ospreys was the most successful player on the night, his hat-trick including a fine 11-9, 11-9, 12-10 victory over Chris Simson. Maci Harvey and Mark Lamb contributed a valuable point apiece for the Ospreys whilst, for the Kites, Simson and Carl Hubbard won two each and shared a doubles win. There was another early-season repeat result, and another drawn match, in the all-Nomads clash between the Leopards and the Lynx, Liam Harris of the Lynx taking his three and Dave Harris two. For the Leopards, there were two for Tom Collins and one each for Roger McNaughton and Dave Wright, with Collins and McNaughton sharing an excellent 11-6, 11-8, 9-11, 11-8 doubles win over Harris and Harris. Each team won a match that went the distance with Collins involved in both of them, beating Dave Harris 11-5 in the decider in match one but losing by the same score to Liam Harris in match ten. Nomads Ocelots and Brotherhood J enjoyed a good scrap before the Ocelots emerged narrow 6-4 winners. Arthur Wells-Garrett picked up a hat-trick for the winners and, with Sue Lee, shared a close doubles win over Harley Wood and Oleksandra Klymenko 11-5 in the decider. Lee picked up a couple for the Ocelots, including an 11-7, 10-12, 8-11, 11-5, 11-8 victory over Wood. Klymenko took two points for Brotherhood, with Harley Wood and John Wood, making his Clacton League debut, winning a point apiece. 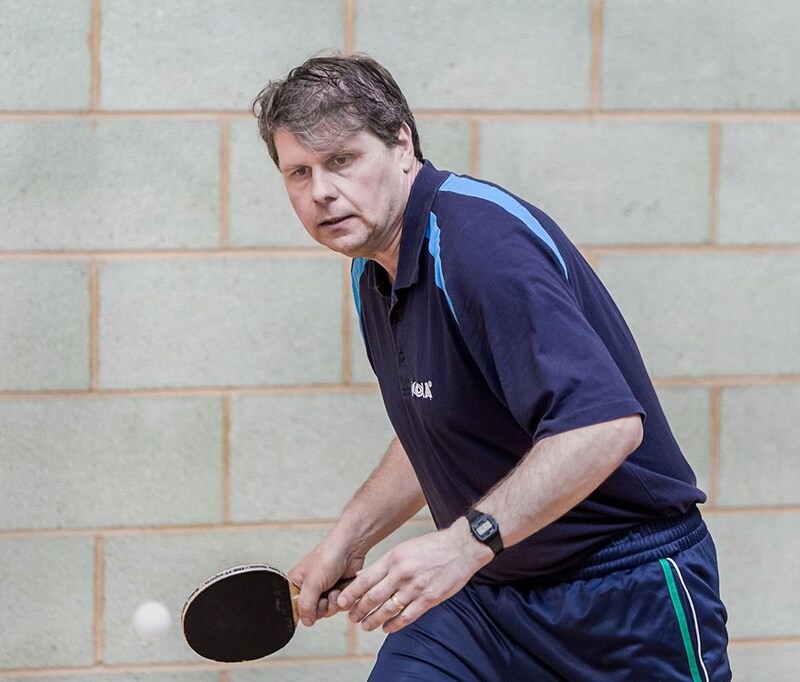 * In Division Two of the Veterans' Section of the Essex Inter-League Clacton's Phil Smith, Colin Webber and John Hatley emerged narrow 5-4 victors over their counterparts from Burnham. In a match that see-sawed throughout, each of the town players won a singles whilst Webber was successful in both his doubles matches with each of his team-mates. The closest, and ultimately critical, match was the penultimate encounter in which Hatley beat Neil Want 11-6, 5-11, 11-5, 9-11, 11-9. * The draw for Round Three of the Knock-Out Cup sees favourites Nomads Panthers drawn against Division Three side Nomads Wildcats whilst Windsor Condors have been handed a tougher tie against Nomads Bobcats of Division Two. There is only one all-First Division clash, Windsor Hawks being drawn against Brotherhood B, a repeat of this week's League match. Nomads Lions v Nomads Pumas. Matches are to be played during week beginning 30th January. * The Handicapped Singles Tournament takes place Saturday 4th February at Windsor's St James Hall with play starting at 9.30 am. Entries, with the entry fee of £3, can be sent to Tony Oswick or they can be made on-line to pwhite@clactontabletennis.com with the entry fee payable on the day. The closing date is Monday 29th January. For more details contact League Secretary Lyn White (Tel : 01255 425292). Brotherhood B 6 Windsor Hawks 4. Nomads Bobcats 3 Brotherhood H 7. Brotherhood J 4 Nomads Ocelots 6. Clacton (Smith, Webber, Hatley) 5 Burnham A 4.